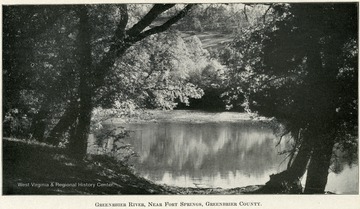 A river mirrors the distant bank full of leafy trees and a grassy hill. 2. Bridge Over Greenbrier River, Alderson, W. Va.
Bridge Over Greenbrier River, Alderson, W. Va.
3. Concrete and Steel Bridge Across the Greenbrier River at Alderson, W. Va. 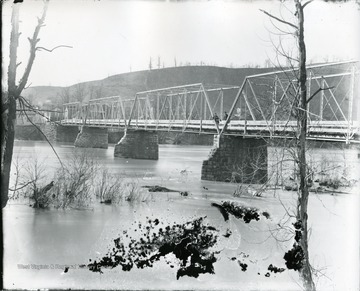 Concrete and Steel Bridge Across the Greenbrier River at Alderson, W. Va.
4. 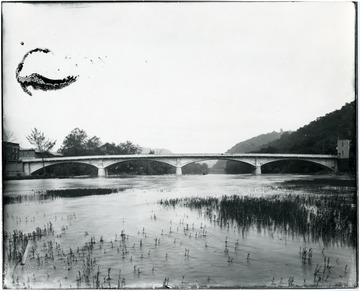 Concrete Bridge Across Greenbrier River at Alderson, W. Va.
5. 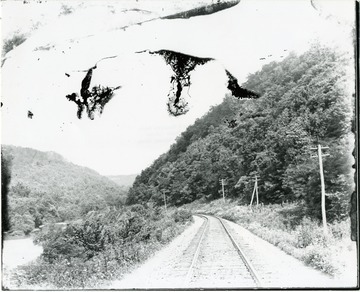 Chesapeake and Ohio Single Track Main Line, East of Alderson, W. Va.
Chesapeake and Ohio Single Track Main Line, East of Alderson, W. Va.
6. Greenbrier River from Bridge at Alderson, W. Va.
Greenbrier River from Bridge at Alderson, W. Va.
Greenbrier River from Bridge at Alderson. House visible on the shore. 7. 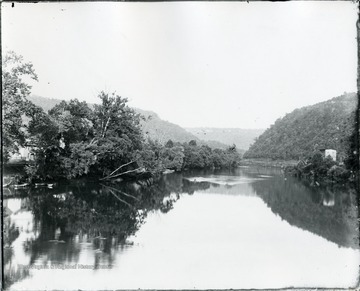 Looking East at Greenbrier River from Bridge at Alderson, W. Va. 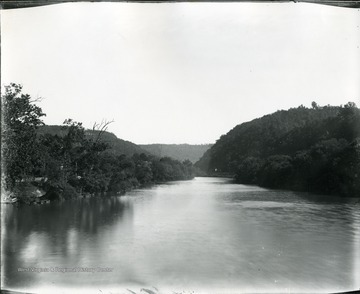 Looking East at Greenbrier River from Bridge at Alderson, W. Va.
View of Greenbrier River from bridge at Alderson. Road visible in the distance. 8. 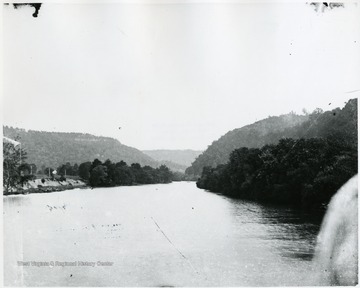 Looking East at Greenbrier River from Bridge at Alderson, W. Va.
View of Greenbrier River from bridge at Alderson. 9. Old Steel Bridge, Looking East along Greenbrier River, Alderson, W. Va.
Old Steel Bridge, Looking East along Greenbrier River, Alderson, W. Va.
Tree lined shore of the Greenbrier River. Steel Bridge in the background. 10. 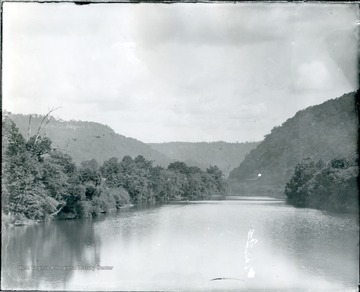 Looking East at Greenbrier River near Alderson, W. Va. 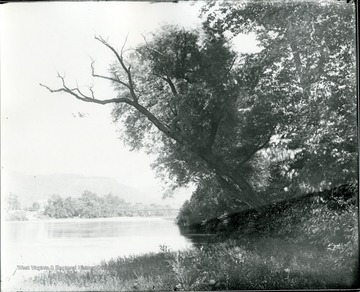 Looking East at Greenbrier River near Alderson, W. Va.
Greenbrier River from near Alderson, looking East. 11. Iron Bridge over the Greenbrier River at Alderson, W. Va.
Iron Bridge over the Greenbrier River at Alderson, W. Va.
Boaters in the foreground. 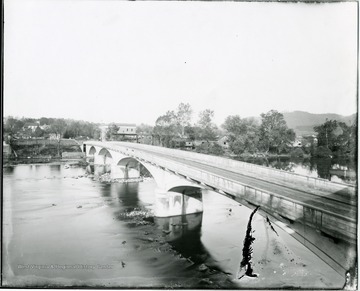 Iron bridge over the Greenbrier River at Alderson. 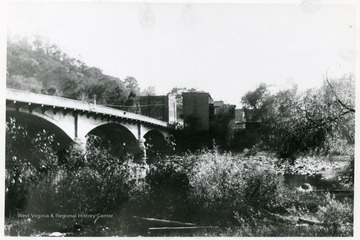 Bridge built in 1881. 12. 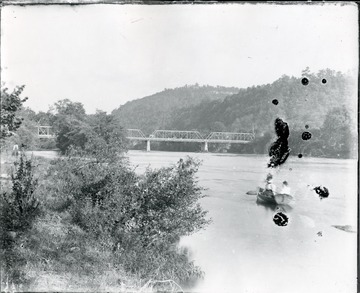 Iron Bridge Looking South, Alderson, W. Va.
Iron Bridge Looking South, Alderson, W. Va.
Two men standing on old iron bridge looking south.